Everyone needs a place to store to their clothes, underwear and general bits and bobs; however, bedroom dressers can cost an absolute fortune! A well-constructed, solid wood dresser can easily cost upwards of $600, and many will easily top $1000 if you’re looking for the best quality. If you’re looking for cheap bedroom dressers at the $500 level, you’ll find most being made from MDF or similar styles of veneer – possibly with a solid wood front or top to give an impression of ultimate quality. Of course, you can also hit the thrift stores and upcycle an older dresser, yet if you have your heart on something brand new and contemporary; check out our top 5 picks for stylish cheap bedroom dressers that won’t break the bank. We thought we’d kick off our review with a well-priced dresser that hits the contemporary look perfectly. The Sauder dresser features 4 separate and equally sized draws, safety stops and a t-lock system to keep those draws exactly where they’re meant to be. One of the amazing things about this bedroom dresser, especially given the price, is the fact it’s made from a large amount of solid wood. Sure, if you go hunting for it, you’ll discover the occasional bit of hardboard lurking in the construction; however, it’s impressive for the price and really gives off a quality feel. The color is what’s known as craftsman oak. Personally, I would describe the wood as a light oak in color – not as light as pine, yet nowhere near as dark as some oaks can go. As with all dressers purchased on the Amazon website, you’ll be assembling this fine dresser yourself. The assembly kit provided with the bedroom dresser is pretty good, with specially made tools that make it easy to assemble the component parts. The only issue I had during assembly, were the draws themselves. The same t-lock system that keeps the draws secure, is a bit of a fiddle to get right. My advice would be to take your time with this bit, go fix yourself a good coffee and have a little patience – you’ll thank yourself when it’s fully assembled! 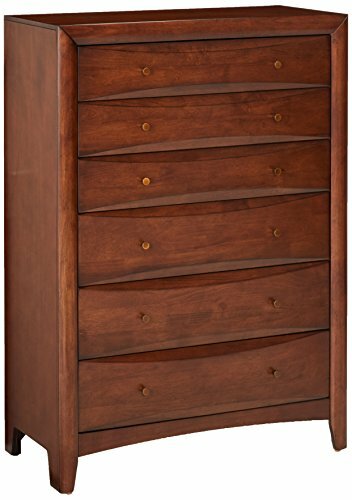 A well-made bedroom dresser that’s easy to put together and looks amazingly solid considering the price, recommended. The American Classic Bedroom Dresser is a far more traditional looking affair and would look perfect if you’re trying to pull off a more country style. Unlike the Sauder, you get 5 draws in this model and it’s a good bit taller than the Sauder above. At this price range, about $400, you get a completely solid pine construction, plus upmarket features like antique handles, styled side panels and properly routed finger pulls. Thankfully, this bedroom dresser comes completely assembled – nothing for you to do at all! However, you’ll need to make sure you’re around to receive delivery as it’s a two man lift and must be signed for. On the plus side, you’ll be able to enjoy your dresser straight away! Well made, solid pine and a classic style that many people will love; however, it’s nearly $400 which might put more budget conscious shoppers off. Here, we’ve ditched contemporary and classic looks for a far more ethnic theme. The Glendora dresser is still made from solid wood, yet it features a light pine design with hints of darker edging that lend a “treasure chest” style. It’s a handsome cheap bedroom dresser, and although you won’t find this dresser rocking out in too many contemporary apartments, it will fit into the home of an ardent traveler with plenty of interesting things to display on it. There are 6 individual draws included in the Glendora dresser, with 3 of them at a smaller size for jewelry, watches and underwear – whilst the lower three are much more cavernous and capable of storing clothes. 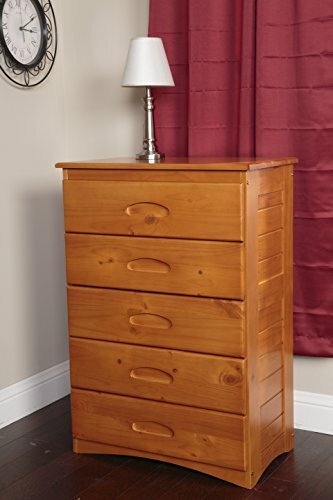 The Glendora bedroom dresser is easy to assemble. Adding the legs, handles and draws are all that needs doing, plus you’ll find the assembly kit and instructions easy to use. One thing I noticed on assembly, was the fact the darker woods are much darker than the pictures show. This is probably because the pictures were taken under fluorescent lamps – something to be aware of. Well made, easy to finish the assembly on and looks great as a standalone ethnic piece of furniture. Our only issue was the fact the darker shades of wood used were much darker in person. 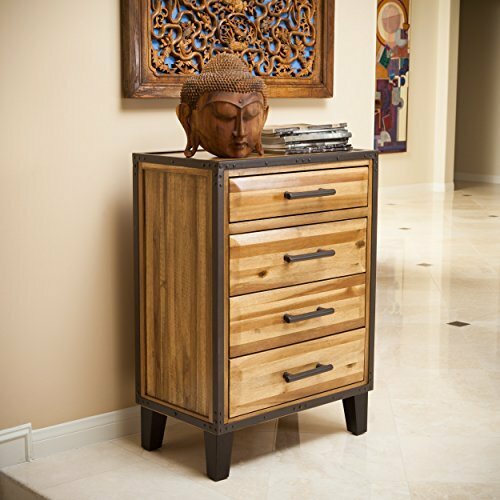 Although we only tested the 4-drawer version, you can purchase this bedroom dresser as a nightstand, 3 drawer dresser and end table – perfect if you’re completely changing your look to an ethnic traveler style. Here, we have a much darker dresser, whilst still managing to maintain a clean, modern look. The construction of this bedroom dresser is quite traditional, with solid drawer runners and a thick veneer that should last the test of time. At almost $400, a solid wood construction is expected and delivered in spades. Everything has a quality feel in this dresser, and as I said above, the veneer looks like it should last for many years. There’s no assembly with this bedroom dresser; however, some customers have said that the delivery system isn’t perfect and some have reported breakages en-route. It’s not a deal breaker for us; however, we would suggest checking the dresser on delivery and make sure everything looks as it should! That’s good advice whatever dresser you purchase. A clean, modern and walnut veneered dresser that should look at home in a contemporary setting. No assembly required; however, some customers have had delivery issues. Another cheap bedroom dresser from Sauder, and this time we’re taking the low priced Pogo version for a trial. 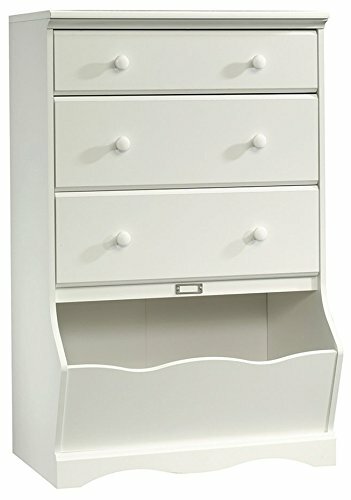 At just over $150, this is a superb budget dresser that should provide long term use for those you can’t afford solid wood construction. The cabinet is split into four separate areas, the top drawer is a smaller version suitable for jewelry and underwear, whilst the next two are dedicated clothes draws. Underneath, however, is where things get interesting. There’s an open drawer that’s perfect for shoes and possibly things like scarfs or hats. We also think this could be a great dresser for a child’s bedroom, with the lower opening perfect for small toys. Oh boy! You’ll have to ensure your assembly skills are up to scratch whilst putting this bedroom dresser together. In a similar vein to IKEA furniture, this dresser comes flat packed and you’ll need to assemble it all. Even so, the instructions are good, like other Sauder furniture, plus you’ll get everything needed to get your dresser assembled included. One top tip from is, ask a friend or relative who has a good tool kit to help you. We found a set of decent screwdrivers handy whilst assembling the Pogo-3. A solid, well-made budget buy with a decent veneer finish and well put together assembly instruction – even if you need to do a lot of assembly to put the Pogo-3 together. For the price, we were impressed by the quality on offer and wouldn’t hesitate to recommend this bedroom dresser if you’re on a budget. The cheap bedroom dresser that really blew us away, was easily the Sauder 418175 Oak unit. 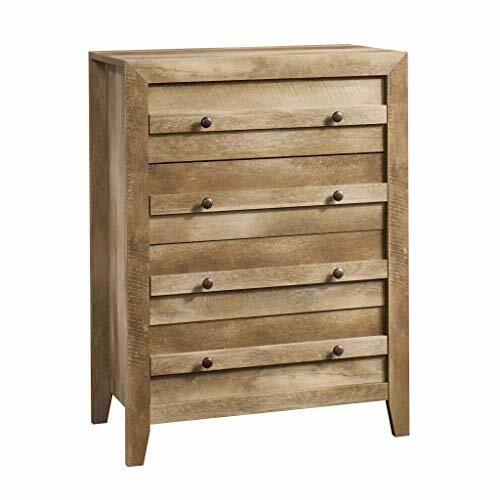 Well priced at under $200, and even sporting some solid wood elements, you really won’t find a better-built dresser for the money. It’s also manufactured in a much lighter oak than you would think, making it a solid contemporary choice. Next up was the Glendora bedroom dresser, a nice item that was well made and featured some pretty upmarket style choices. The only thing that knocks this off out best buy perch, is the fact the ethnic style means it’s a choice for a specific style of a room. On the budget end of the scale, there really is no choice! The Sauder Pogo-3 is a solid cabinet that’s easily going to provide years of use for the money. Of course, you’ll need to become friendly with a toolkit to put it together, yet we think that’s a small price to pay for a cabinet that will provide lots of use for little outlay. The American Classic dresser is a decent choice; however, we feel it’s a very specific style of a bedroom dresser that won’t suit all rooms – it’s also $400 which is enough of a price tag to put many off. Still, it’s a premium product, and if your heart if set on a country feel them you’ll be more than happy with it.